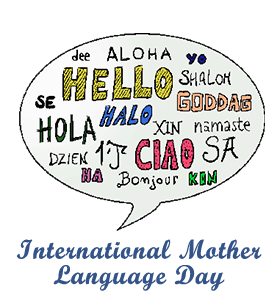 ﻿International Mother Language Day: Calendar, History, Tweets, Facts, Quotes & Activities. International Mother Language Day seeks to promote linguistic and cultural diversity and multilingualism. The day also seeks to support quality education, unity, diversity and international understanding. Language is the most effective way humans have of communicating with one another and acts as a powerful instrument in the preservation and development of cultures and ethnicities. According to UNESCO, as of 2018, about 2,500 languages, and thus their cultures, are currently at risk of extinction within a few generations. International Mother Language day was proclaimed by UNESCO in November of 1999 and was first observed on February 21, 2000. The chosen date commemorates the date on which a group of university students were killed by the Pakistani Police in Dhaka (now Bangladesh) for using their mother language. In 2018, the theme for International Mother Language Day is "Our languages, our assets". There will be a debate at the UNESCO Headquarters in Paris about it. As of 2018, the number of known, spoken languages is 7,097. Around a third are endangered and have less that 1,000 speakers. The most widely spoken languages in the world by native and non-native speakers are: Mandarin, English and Spanish. The five most difficult languages to learn for an English speaker are Arabic, Cantonese, Mandarin, Japanese and Korean. Mother languages in a multilingual approach are essential components of quality education, which is itself the foundation for empowering women and men in their societies. — Irina Bokova, UNESCO Director General. Read about language acquisition and its critical period. Language and The Mind is an educational read by world renowned scientist Noam Chomsky. Host a language party. Invite friends from all over the world and play games requiring each one of you to teach a few basic words in your language and the others to make use of them. Make a financial or time donation to an organization that aims to preserve endangered languages in the world. These organizations work with communities whose languages are at risk of extinction and promote the use of the language in education and communal life. Some such organizations include, The Linguistic Society of America and The Endangered Languages Project. Gather with friends and family to assess your local education system. Does it provide adequate language instruction and second language instruction? Second language acquisition has been linked with critical thinking, creativity and flexibility of the mind. Generate awareness for International Mother Language Day by using the hashtags #InternationalMotherTongueDay, #IMLD, #motherlanguage or a hashtag followed by the language of your post (#english, #bengali, #xhosa).